While astrocytes are recognised to play a central role in repair processes following stroke, at this stage we do not have a clear understanding of how these cells are engaged during the chronic recovery phase. Accordingly, the principal aim of this study was to undertake a quantitative multi-regional investigation of astrocytes throughout the recovery process. Specifically, we have induced experimental vascular occlusion using cold-light photothrombotic occlusion of the somatosensory/motor cortex in adult male C57B6 mice. Four weeks following occlusion we collected, processed, and immunolabelled tissue using an antibody directed at the glial fibrillary acidic protein (GFAP), an astrocyte specific cytoskeletal protein marker. We investigated GFAP changes in 13 regions in both the contra- and ipsi-lateral hemispheres from control and occluded animals. Specifically, we examined the infra-limbic (A24a), pre-limbic (A25), anterior cingulate (A32), motor (M1 and M2) cortices, the forceps minor fibre tract, as well the shell of the accumbens, thalamus, cingulate cortex (A29c), hippocampus (CA1-3) and lateral hypothalamus. Tissue from occluded animals was compared against sham treated controls. We have identified that the focal occlusion produced significant astrogliosis (p < 0.05), as defined by a marked elevation in GFAP expression, within all 13 sites assessed within the ipsilateral (lesioned) hemisphere. We further observed significant increases in GFAP expression (p < 0.05) in 9 of the 13 contralesional sites examined. 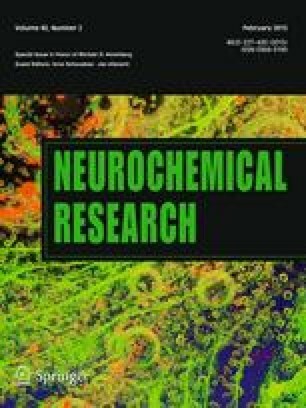 This work underscores that both the ipsilateral and contralesional hemispheres, at sites distal to the infarct, are very active many weeks after the initial occlusion, a finding that potentially has significant implications for understanding and improving the regeneration of the damaged brain. Special Issue: In honor of Michael Norenberg. Madeleine J Patience and Ihssane Zouikr have contributed equally to this work. F. R. W. acknowledges project Grant support from the Australian National Health and Medical Research Council. M. N acknowledges the support from the University of Newcastle’s Brawn Fellowship, the Hunter Medical Research Institute (HMRI) and the Sten A. Olsson Foundation for Science and Culture.